What’s the deal with these new maritime boundaries from old, never fully defined or bilaterally agreed upon land boundaries? I’ve recently come across three of these scenarios, all, strangely enough, with former or current Dutch possessions. 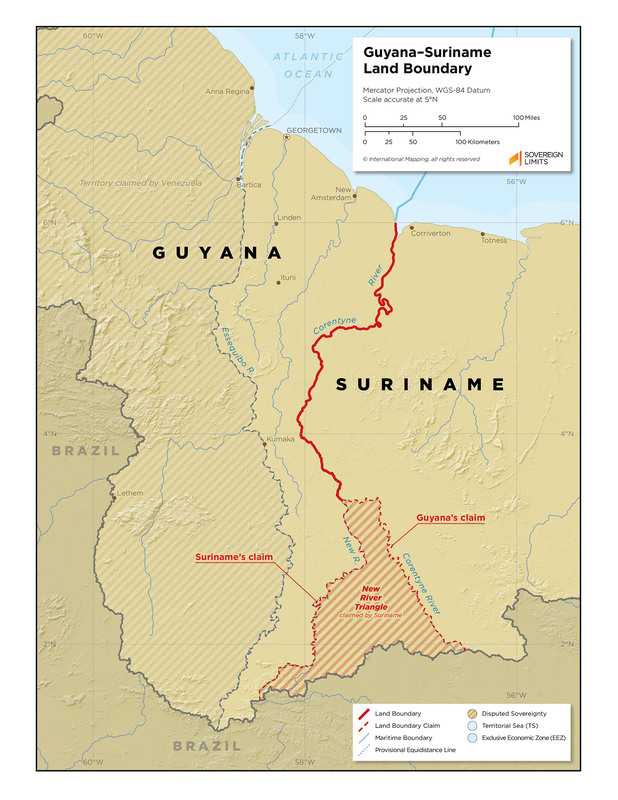 In 2007, Guyana, a former British colony, had its maritime boundary with Suriname, a former colony of the Netherlands, awarded by the Permanent Court of Arbitration. In reading through court proceedings, their lack of an established land boundary felt like the elephant in the room. Much of their land border follows the western (Guyanese shoreline) bank of the Courantyne River, but at various points in history, the United Kingdom and later independent Guyana claimed the thalweg of the river rather than its shore. Today, it seems like the western bank is de facto accepted as the international boundary between them, though there is a large territorial dispute in the south over the New River Triangle. Despite the ill-defined land boundary, the Court was able to comfortably begin their maritime boundary on the low tide coast, and the maritime space between them is now well-defined and undisputed. The map shows the 2007 maritime boundary extending from the de facto and disputed land boundary. 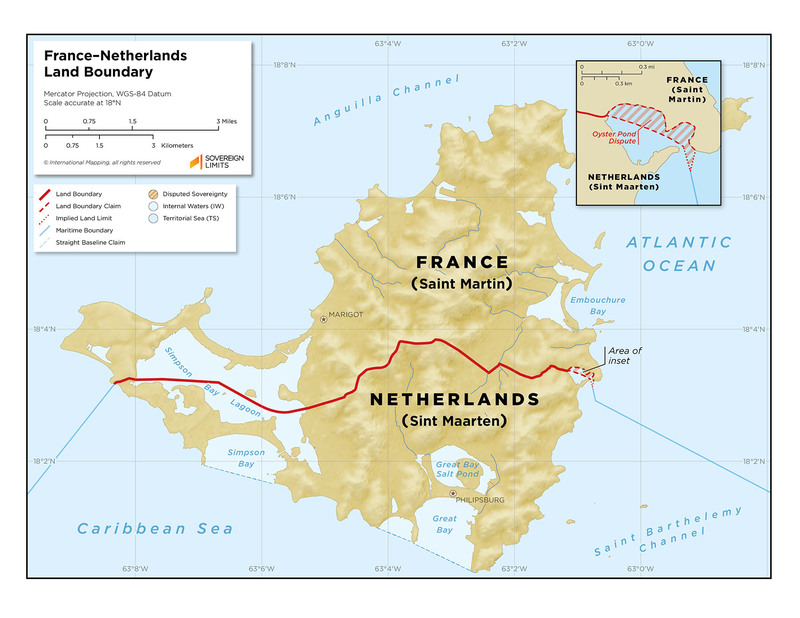 Saint Martin and Sint Maarten, which share an island in the Caribbean Sea, are both still connected to their colonial powers, France and the Netherlands, respectively. Sovereignty on the island was initially split in 1648, and not much additional definition to the land boundary seems to have been applied since. The eastern land boundary terminus (LBT) is in dispute as sovereignty over Oyster Pond is in question. And yet, in 2016, France and the Netherlands agreed to a maritime boundary dividing their Caribbean possessions. The eastern section of the maritime boundary begins at a point defined in WGS-84 on the coast, giving us a little more information about what must be the location of their land boundary. The western section, however, begins off the coast of Oyster Pond, allowing both countries space between their disputed land boundary and now established maritime boundary. This Agreement was ratified in 2017. The map shows the undelimited land boundary and the 2017 established maritime border. 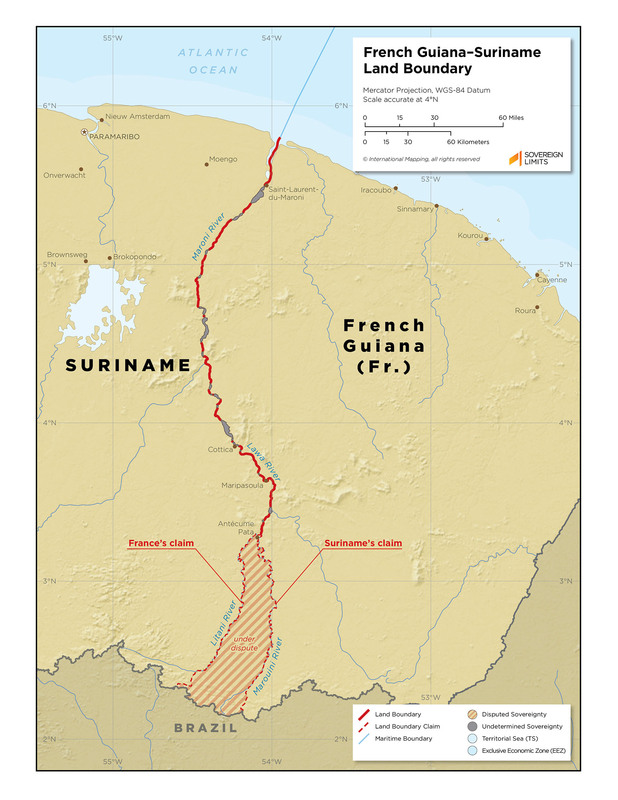 France also signed a boundary agreement with Suriname in 2017, marking the second current or former Dutch possession to have one of its maritime boundaries recently delimited. In this Agreement, they established a closing line across the mouth of the Maroni River where it empties into the Atlantic Ocean and began their maritime boundary from this point. Meanwhile, it is completely unclear as to the location of their land boundary in the Maroni River. France and the Netherlands made several draft attempts at formalizing the land boundary between their colonial possessions in South America, but due to a variety of reasons, including the disputes over the Maroni River and the source of the Kutari River and World War II, none of the agreements were ever signed. The map shows the de facto and disputed land boundary along with the 2017 unratified maritime boundary. There are a variety of factors which may contribute to the establishment of a maritime boundary beginning from a de facto or disputed land boundary. A primary motivation may be economic. There are an abundance of resources to exploit in the ocean—oil, natural gas, fish—all of which are more easily and efficiently obtained when the maritime boundary is well-defined. Another factor may be a difference in perceived stakes/value. Territory on land is tangible: that tree over there, it’s definitely on the French side of Saint Martin. Maritime space, on the other hand, is vast and difficult to define. The average individual can only interact with maritime boundaries on maps and in media coverage. It is therefore easier for the public to allow for compromises to be made to delimit boundaries at sea than those on the ground. In addition to the above reasons, land boundaries have centuries of baggage that go along with them. All of those agreements, drafts, meetings, and attempts at defining the boundary through here or there add up. Families for centuries may have thought they belonged to one country, but when a boundary is formally defined, end up in another. This causes all kinds of social issues. There aren’t people living in newly defined maritime space. Occasionally, historic fishing rights are impacted, but these are often addressed in negotiations or adjudication. Or perhaps these successful maritime negotiations were the result of being a former or current colony of the Netherlands in the western hemisphere.